Dryer Vent Cleaning Eldorado Hills CA 916 519 4569 Dryer Vent Cleaning Eldorado Hills, CA 916-519-4569: Dryer Vent Cleaning: The Wizard of Eldorado Hills asks "Is your Dryer Vent System Safe?" 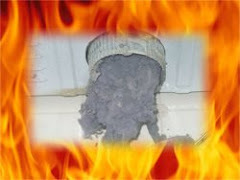 Dryer Vent Cleaning: The Wizard of Eldorado Hills asks "Is your Dryer Vent System Safe?" If you keep up with annual maintenance of your household appliances, you are way ahead of a lot of people. Most people know to have their furnaces cleaned regularly for maximum performance and safety; however, many people are unaware of the potential danger that could be lurking in their dryer vent system. Experts find fire hazards in 99 out of 100 clothes dryers and vent systems they inspect.